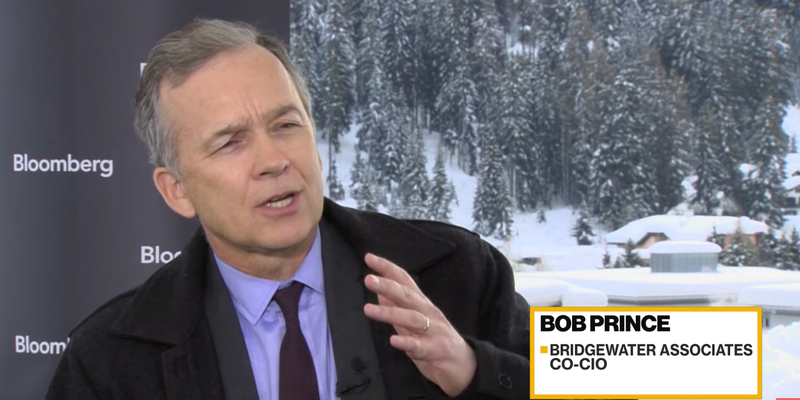 Bob Prince, the co-chief investment officer at Bridgewater Associates — the world’s biggest hedge fund — gave an exclusive interview to Business Insider last week at the World Economic Forum’s Annual Meeting in Davos, Switzerland. Prince explained why the economy is headed for „20 years of ugliness,“ rather than an acute recession to rival the 2008 financial crisis. He also outlined his views on what’s next for the US market and economy now that the Federal Reserve is scaling back monetary tightening. DAVOS, Switzerland — Not all economic recessions are created equal. While that may seem like an obvious statement, the nuances that have separated meltdowns throughout history often go overlooked when negative headlines abound. That’s why it can be so easy to see a recession warning and immediately think of the 2008 financial crisis, which was the worst since the Great Depression. But Bob Prince, the co-chief investment officer at Bridgewater Associates — the world’s biggest hedge fund — was more measured in his outlook during a recent interview with Business Insider. While he does think an economic slowdown is in the cards, he expects it to unspool over a prolonged period. At the center of Prince’s slow-burn view is what he perceives as a toxic combination of populism and income inequality. He argued that it’s a deep-rooted issue that could stretch for decades — one with no quick fix. Not even the 70% marginal income tax on the super wealthy recently floated by Rep. Alexandria Ocasio-Cortez can save the day, Prince said. Followers of recent commentary from Ray Dalio — Prince’s co-CIO — should already be well familiar with Bridgewater’s view that divisive politics will make the next downturn that much more painful. Of course, no measured view of an economic slowdown can be truly complete without an acknowledgement of the elephant in the room: the crippling debt load being held by both US companies and consumers. With respect to that, Prince said the US finds itself at a „key juncture“ best characterized by a broad, market-wide deleveraging. Now that the Federal Reserve is tasked with unwinding roughly 10 years of unprecedented monetary stimulus, any credit pullback could be bad news for investors. Fortunately for debt-holders, the recent economic slowdown may keep the Fed from raising rates further, at least for a while. That should allow them some wiggle room when it comes to paying down obligations or refinancing. But that doesn’t mean the market as a whole is in the clear. According to Prince, the fact that so much of the US Treasury’s debt is owned by foreigners leaves those holdings exposed to foreign-exchange risk. While the dollar has shown great strength versus its developed-market peers over the past several months, Prince said a reversal of that trend could prompt unpredictable behavior from overseas investors. And then there’s the stock market, which Prince identified as the most likely short-term pain point for the US. Amid all the talk swirling about the economy and a possible recession, it’s equities that have his attention.